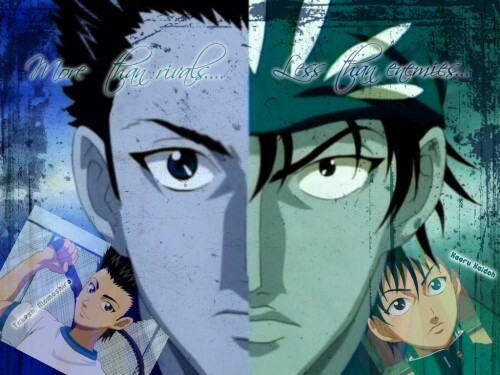 A Wallpaper on the eternal rivals of Seigaku! Nice wallpaper !!! I love it !!! Momo and Kaidoh !! They are so cool and kaku-i !!! Nice work !!! Like the picture during they are younger. Great job !! Thank for sharing !! The one who make it is so skillful. He/She can capture the rivalry aura. even though they are great rivals but they are a great team. my two favourite characters in one wallpaper, i dream come true. IT LOOKS AWSOME,KAIDO AND MOMO ARE TWO OF MY FAVE CHARACTERS(ESPECIALLY KAIDO^_^)!ITS GREAT VENAMALFOY KEEP IT COMING^_^! love this couple "great "